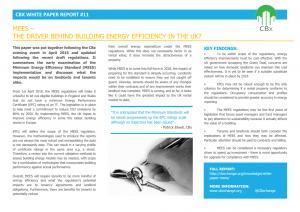 This paper was put together following the CBx evening event in April 2015, to show how the Minimum Energy Efficiency Standards will affect landlords and tenants alike. The regulations are already having the biggest impact of any energy regulation on the commercial property market with price chipping a key risk for any transaction. They will require all eligible domestic and non-domestic private rented properties in the sector to be improved to a specified minimum standard which is proposed at an Energy Performance Certificate (EPC) rating ‘E’. Our panel of experts presented an early examination and clarification on the details of MEES implementation and discussed the role of EPCs in the regulations. With special thanks to our fantastic panel of experts; Polly Plunket-Checkemian of Cushman & Wakefield, Professor Paul Ruyssevelt of UCL Energy Institute, Patrick Brown of British Property Federation, Dan Grandage of Aberdeen Asset Management PLC and Philippa Gill of Tishman Speyer (January 2007 to January 2015).